Learn the ultimate goal-setting discipline and financial management techniques from a man who knows how to turn his goals into wealth. Discover the millionaire mindset—the Trump way! There are multiple paths to wealth, learn the perfect path for you. If you start or own a business, the odds are against your success. Eighty percent of new companies fail in the first five years, and many of the survivors struggle to keep afloat. Even successful entrepreneurs pay dearly for their achievements, with long hours, few vacations, and constant financial anxiety but it doesn’t have to be that way. There is a way to build a flourishing business and have a life you can call your own, and the speakers in this audio series can help you achieve your goals. Enjoy this All-Star faculty including 11 audio CDs, 1 DVD and 4 CD-ROM software programs. DONALD TRUMP, founder and chairman of Trump University, is the most successful real estate developer in the United States, and a dominant figure in the business world. A bestselling author of seven books and star of The Apprentice television series, The Donald serves as a mentor and inspiration to millions of people worldwide. For over twenty years, JEFF BURROWS has helped people grow and their businesses profit, without sacrificing their personal lives or their dreams. With a unique blend of passion, vision, action, and spirit, he has guided owners of companies of all sizes-from start-up to $50 million. Jeff Burrows is a published author and contributor to Donald Trump’s audio business course How To Build a Fortune. JAMES BURGIN is founder and CEO of Brandwithin, a Phoenix-based branding consultancy and information product marketing company. His clientele have included Robert Kiyosaki of “Rich Dad” fame, TV personality James Van Praagh, and sales trainer Blair Singer. 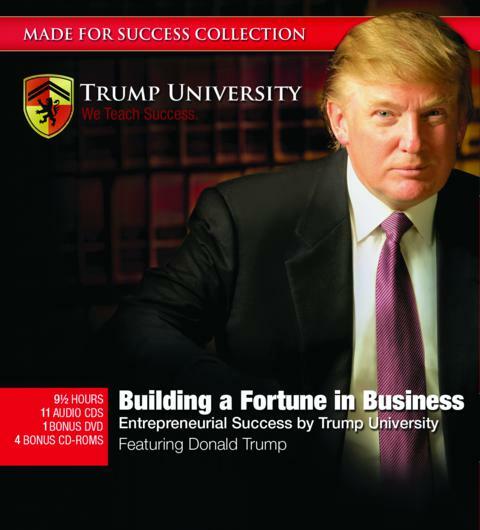 His company, Brandwithin, produced this audio business course and many other Trump University programs, including The Wealth Builder’s Blueprint. JON WARD is a twenty-five-year marketing veteran and a consultant to Brandwithin, the producers of this program. He is host and interviewer for several Trump University home study programs, including The Wealth Builder’s Blueprint and How To Build a Fortune. He also created the Marketing Action Program, a step-by-step system that generates practical, results-driven marketing plans. LES HEWITT is known to thousands of readers through his book, The Power of Focus, which he co-authored with Jack Canfield and Mark Victor Hansen. He is also a contributor to Donald Trump’s audio business course How To Build a Fortune. An entrepreneur for twenty-five years and a top performance coach, Les has a passion for sharing leading edge strategies that dramatically improve the quality of life-and the bottom line.